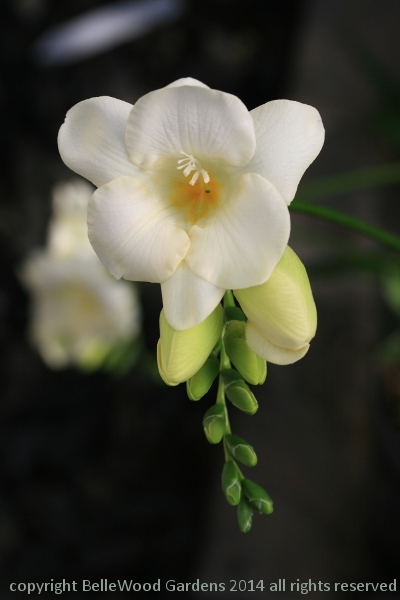 White, often with a purple flush on the outside, sometimes with a yellow mark on the lowest tepal, I think Freesia alba has the strongest and sweetest fragrance of all the freesias, and that includes the other wild species and the hybrids. Scent, it is said, is the most evocative of our five senses. It opens the doors of memory. Recently, I brought some freesias to my friend Lisa, pastry chef at The Bridge Cafe. And here is the memory the flowers awakened. We lived on the Southlands Estate on the South shore of Bermuda. Our abode was above the once well used stables and it was bright and breezy being up the hill a quarter mile or so from the beach. It was named "Dapples" (homes in Bermuda are named, not numbered). The main home had an enormous horseshoe shaped driveway, with limestone walls and native Bermuda cedar gates. Within the semi circled drive were trees, shrubs and flowers too numerous to mention. In very early spring, the lawn in this sanctuary was overrun with creamy white Freesias, the uncultivated variety, in the thousands! As the breeze came off the south shore, the fragrance from the Freesias enveloped our little home at "Dapples". A very fragrant, mainly coastal species from the winter rainfall regions of the South African Cape Freesia alba is one of the easiest Cape bulbs to grow, and a wonderful choice to pot up for winter flowers. Symbolic of innocence, their scent is fresh and delightful. 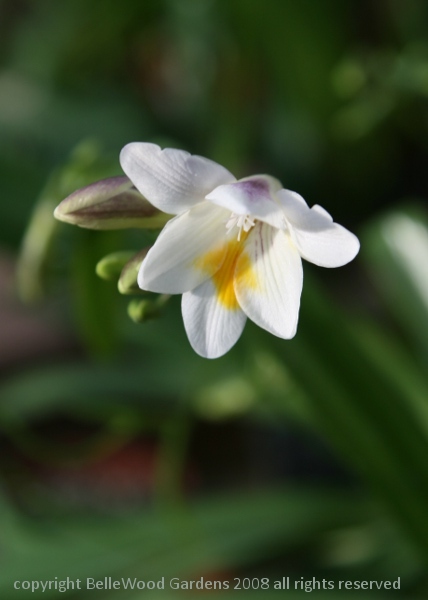 Incredibly, deliciously strong, it's not sickly like the often cloying scent of paperwhite narcissus. Among the cultivars, the white and yellow ones have the strongest perfume, and if cut when only one bloom has opened some last an astonishing three weeks. Red freesias are next, the blues and deep pink cultivars are even less fragrant, and also have a shorter life as cut flowers. Their life cycle goes like this: active growth in autumn to winter, flowering in spring, and dormant in summer. Plant the corms in autumn, October and November, for flowers in February and March. I plant seven corms to a 6 inch diameter pot, using regular potting soil with some extra coarse sand or aquarium gravel to improve the drainage. Give the pots one good watering, and then hold back until green shoots begin to appear. 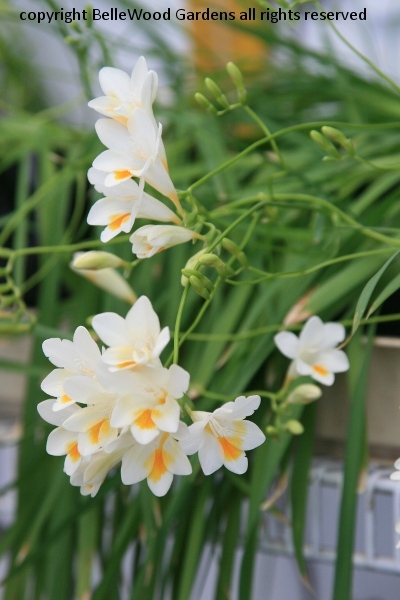 Freesias need to be grown in cool conditions, and the usual suggestion is to keep them at a temperature range of 50 to 55 degrees Fahrenheit. The thermostat for my greenhouse is kept just a bit above 50 degrees Fahrenheit, mostly for reasons of economy (propane is costly and greenhouses are not well insulated structures.) And the freesias (and some other plants) love it. Freesias are floppy plants. Some of this may be attributable to their season of growth - winter's short days and lower light intensity. Both foliage and flowers are unable to support themselves. Large-mesh wire netting is one option, thin green bamboo canes and a corset of twine is another. While the freesias are in active growth I fertilize every 10 days to two weeks, with Jack's Classic Blossom Booster. 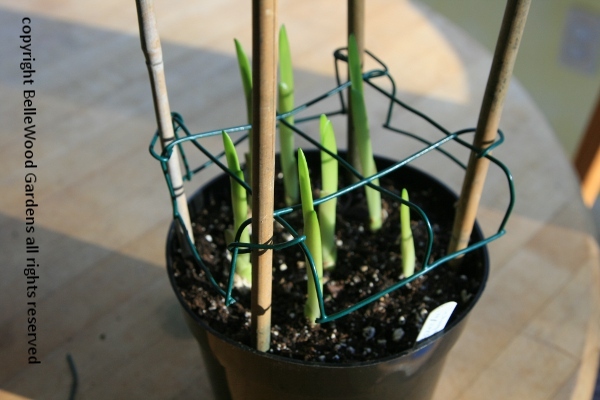 The analysis is 10-30-20, and - since the bulbs are repotted with fresh soil each year - the fertilizer is applied at half strength. 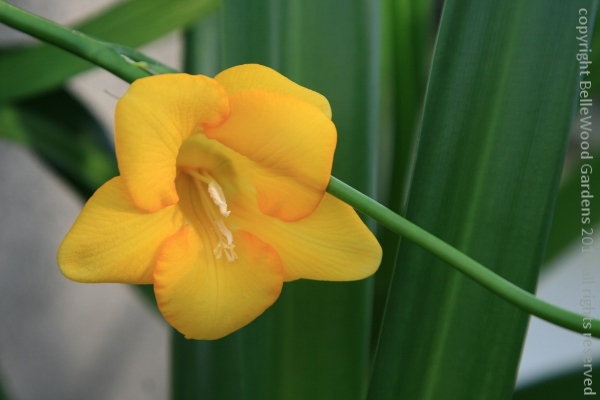 After flowering, keep them in growth until the leaves yellow and die back, gradually reducing watering. 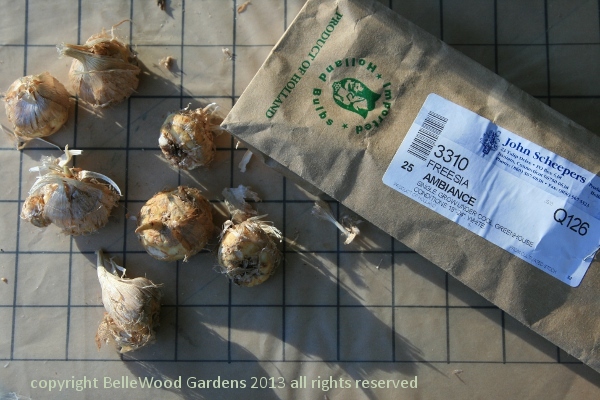 Overwatering, especially of dormant, potted freesias, soon results in rotted corms. Cut the stems back to 1 inch and dry them off over the summer for re-planting in the autumn. Commercially, for reliable flowering the corms would have been subjected to a dormancy heat treatment - an average of 12 weeks at 86 degrees Fahrenheit. I mimic this by leaving my now-dormant, still potted freesias in the greenhouse. The idea is to simulate the conditions in South Africa, where they dry out and become dormant in the hot summer, only beginning to grow in with warm autumn rains. Winter, with its cooler temperatures, initiates flower bud formation. Corms of Freesia 'Ambiance' on a one-inch grid, in November. 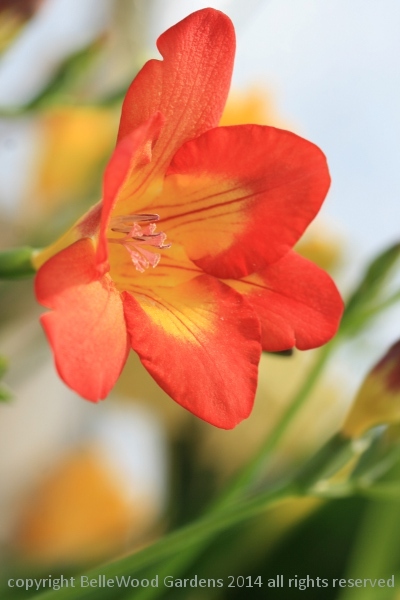 Freesia 'Ambiance' in flower in mid-February. 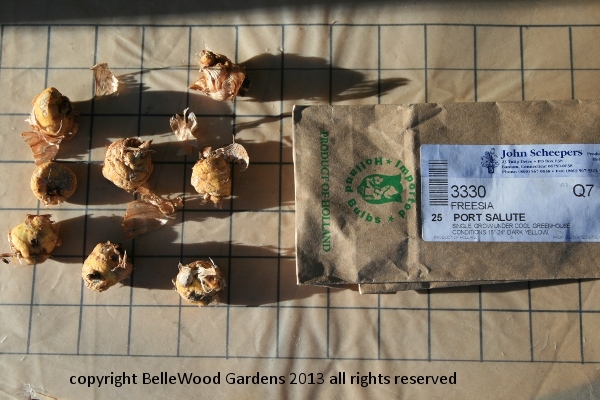 Corms of Freesia 'Port Salute' on a one-inch grid, in November. I was dubious as to their quality, but knew I had ordered late. Freesia 'Port Salute' coming into bloom in mid-February. Glad to see my misgivings were misplaced - lovely, fragrant flowers. 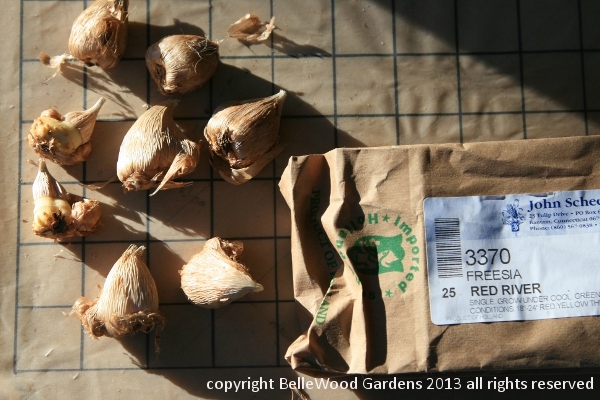 Corms of Freesia 'Red River' on a one-inch grid, in November. Freesia 'Red River' just coming into flower in mid-February. 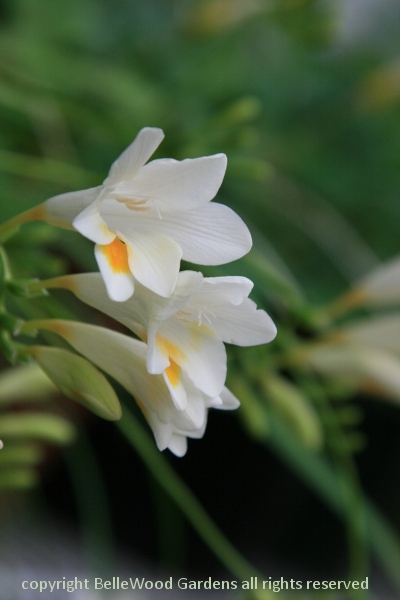 Freesias were first imported to Europe at the end of the 19th century, and have been popular ever since. For sure, they're currently popular with me. And Lisa.